Baronius Press: The Dialogue of St. Catherine of Siena. St. Catherine of Siena is recognized as one of the most remarkable mystical theologians of the Middle Ages. She was also a stigmatist, counsellor of popes and is one of only three women to be made a Doctor of the Church. 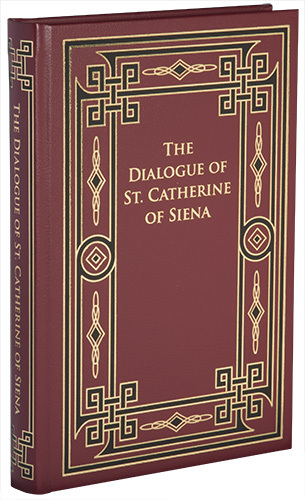 The Dialogue of St. Catherine of Siena treats of the whole spiritual life of man in the form of a series of colloquies between the Eternal Father and the human soul (represented by Catherine herself). The structure of the Dialogue is unusual: the saint makes four petitions to God � for herself, for the Church, for the whole world, and for the assurance of God's providence in all things. The rest of the book is devoted to God's response to these four petitions. The Dialogue of the Seraphic Virgin St. Catherine of Siena - translated from the original Italian, and preceded by an Introduction on the Life and Times of the Saint, by Algar Thorold. This edition has been re-typeset using the text of the 1943 edition originally published by The Newman Bookshop, Westminster, Maryland under the Imprimatur of Gulielmus, Episcopus Arindelensis, Vicarius Generalis, Westminster, 13th December 1906. One of the greatest books of mystical theology ever written, by one of the most amazing women of all time. The Dialogue of St. Catherine of Siena treats of the whole spiritual life of man in the form of a series of colloquies between the Eternal Father and the human soul (represented by Catherine herself). The structure of the Dialogue is unusual: the saint makes four petitions to God � for herself, for the Church, for the whole world, and for the assurance of God�s providence in all things. The rest of the book is devoted to God�s response to these four petitions. [I]ts special value lies in the fact that from first to last it is nothing more than a devotional exposition of the Creeds�.In the Dialogo we have a great Saint, one of the most extraordinary women who ever lived, treating in a manner so simple and familiar as at times to become almost colloquial, of the elements of practical Christianity. A strong theological colour runs through the writings; at times they soar to the very heights of mystical theology, for she had mystical experiences of all kinds, even the highest; but they abound also in practical teaching on the ordering of life in the world. By turns down to earth and scaling the most exalted heights of mystical experience, abounding in unforgettable imagery, it has been described as the mystical counterpart in prose of Dante�s Divine Commedy. Catherine Benincasa was born at Siena on 25th March, 1347. Her father, Giacomo di Benincasa, was a dyer; her mother, Lapa, the daughter of a local poet. At the age of six, she had a vision of Christ over the Church of San Domenico. The next year, she consecrated her virginity to Christ. Her favourite sister�s death in 1362 led her to commit herself radically to Christ. In her sixteenth year she took the habit of the Dominican Tertiaries, and for the next three years she led a life of seclusion in a little room in her father�s house. During this period she learned to read; at the end of it, she underwent the mystical experience known as the �spiritual espousals.� She now rejoined her family and began to tend the sick, serve the poor, and labour for the conversion of sinners. During the summer of 1370 she received a series of special manifestations of Divine mysteries, which culminated in her �mystical death�, in which she had a vision of Hell, Purgatory, and Heaven. Following this, she was filled with a renewed enthusiasm to bring the message of Christ to others. She began to dispatch letters to men and women in every condition of life, entered into correspondence with the princes and republics of Italy, was consulted by the papal legates about the affairs of the Church, and set herself to heal the wounds of her native land by staying the fury of civil war and the ravages of faction. She implored the pope, Gregory XI, to leave Avignon, to reform the clergy and the administration of the Papal States, and ardently supported his design for a crusade, in the hopes of uniting the powers of Christendom against the infidels, and restoring peace to Italy by delivering her from the wandering companies of mercenaries. In April, 1375, at Pisa, she received the Stigmata in the church of Santa Cristina. In June, 1376, she was sent by the Florentines on an ambassadorial mission to Avignon. Although it proved unsuccessful, she made such a profound impression upon the pope that he returned to Rome on 17th January, 1377. It was also in 1377 that Catherine learned to write and began work on her Dialogue. Early in 1378 she was sent by Pope Gregory to Florence, to make a fresh effort for peace. In June, Catherine narrowly escaped assassination when riots broke out in the city. She remained in the environs of Florence until the beginning of August, news reached the city that peace had been signed between the republic and the new pope, Urban VI. Catherine then instantly returned to Siena, where she resumed work on her Dialogue, completing it in October. In the meantime the Great Schism had begun, when, on the 20th September, disaffected cardinals elected an antipope, Clement VII. From the outset Catherine firmly supported the Roman claimant, Urban VI, who in November, 1378, summoned her to Rome. Here she was to spend what remained of her short life, serving the destitute and afflicted, and working tirelessly for the healing of the Schism. Most of her recorded prayers date from this period. In 1380 her health deteriorated rapidly. She heroically besought her Divine Bridegroom to let her bear the punishment for all the sins of the world, and to receive the sacrifice of her body for the unity and renovation of the Church. St. Catherine of Siena, one of the most remarkable women in history, died at Rome on 29th April, 1380. Canonised by Pius II in 1461, she was made a Doctor of the Church by Paul VI in 1970. We carefully choose fonts for our titles in order that our books are readable even by those with eyesight impairments. It is important to know that the font size alone is not a good indication as to whether a text is easy to read. We therefore encourage our customers to print out a sample page of the title they are interested in to see whether the type of font and the fonts size are acceptable to them. 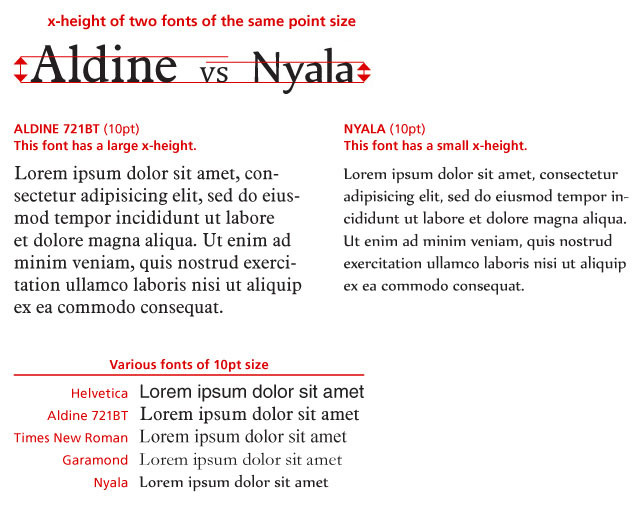 Click here to see an explanation of font sizes and legibility. The point size of a typeface (Font Size) is a measure of its overall height, from the top of the tallest character above the baseline to the longest descender below the baseline. The x-height is what really makes a difference to readability, not font size.